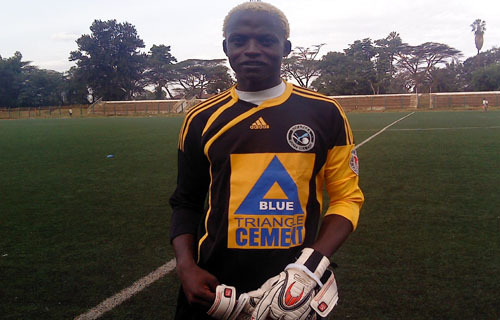 Sofapaka and Kenya national team goalkeeper Wilson Obungu is destined for greater heights with a number of professional teams on his trail. The young African club (Yanga), Simba of Tanzania and South Africa’s Wit waters rand university teams are just but among the few clubs currently engaged in negotiations with the club’s president Elly Kalekwa. Obungu is more than eager to explore the international arena after having a fantastic season with the league champions last year. “All these teams have good credentials and which ever comes first I will gladly accept because it’s my dream to play professional football” said Obungu in regards to the three teams. Famously known as Oburu a name he acquired while playing for Bandari fc in Mombasa, Wilson Obungu studied at Khamisi high school in Mombasa’s Tudor .While in his fourth form at the school in 1999 he turned out for the then premier league side Coast stars before joining Tusker fc in Nairobi immediately after finishing his fourth form. He later went back to Mombasa to turn out for Bandari fc before being snatched by Sofapaka his current squad. “ I don’t even know where these coastal guys got these Oburu name, My name is Obungu but I got used to the previous and that’s what most people call me” He responded referring to his former Bandari team mates when asked to clarify his actual name. Apart from the three disclosed clubs in Pursuit of the custodian, it’s believed there are other six professional clubs with scouts on his trail.These, Sofapaka president Elly Kalekwa is holding to his chest and will disclose soon once he is through with his initial negotiation. Else where Bandari fc’s duo of Clement Defar and Didacus Ochieng are currently undergoing trials with several clubs in Sweden with the hopes of landing a professional career in the country.